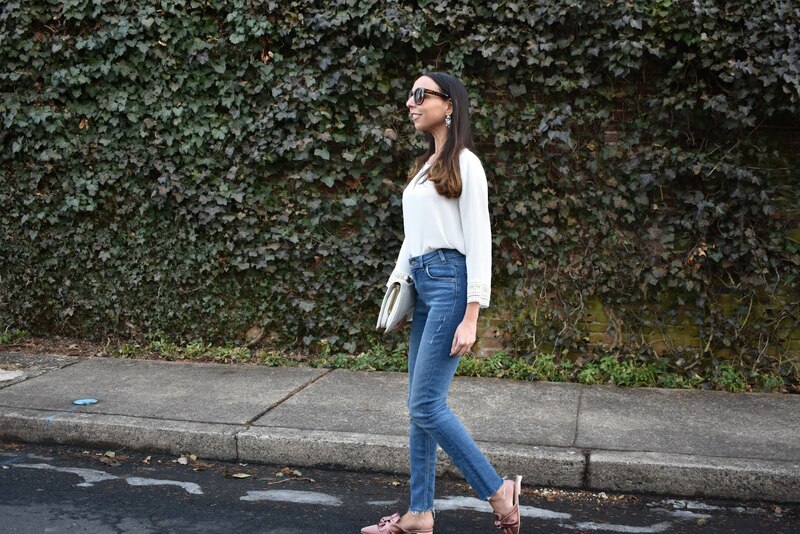 One type of outfit I absolutely love is a simple, classic, neutral palette with great details. Especially if the outfit involves a go-to wardrobe piece or two. I am always intrigued by people who live off a capsule wardrobe. What's a capsule wardrobe? It a small collection of staple pieces (like 37 pieces, random number I know) of pants, tops, sweaters, shorts etc, that won't do out of style but can be made to look different by adding accessories or seasonal pieces. See more about a capsule wardrobe here and here. 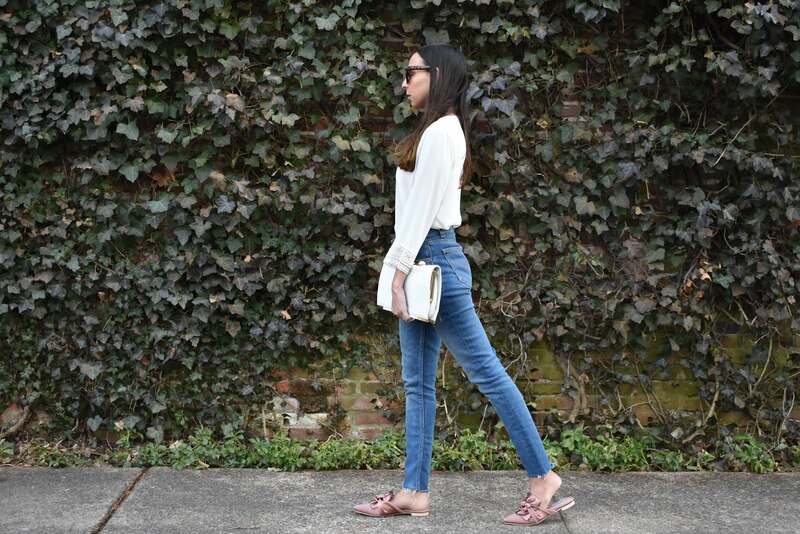 Today I have paired my go-to Levi's (from this post) with an old Forever 21, chiffon top with lace cuff details, my go-to sunnies, a new pair of satin slides with a bow detail, a vintage white clutch and one of my favorite pairs of earrings. The slides are so cute and trendy and an excellent price. I have already gotten so many compliments on them in real life and on Instagram. The clutch has sentimental value because it belonged to my dad's mother who passed away when I was 10 (I think, I might have been a little older). Her name was Abuela Rosa, we are Puerto Rican and Abuela means Grandmother and Rosa was her first name. 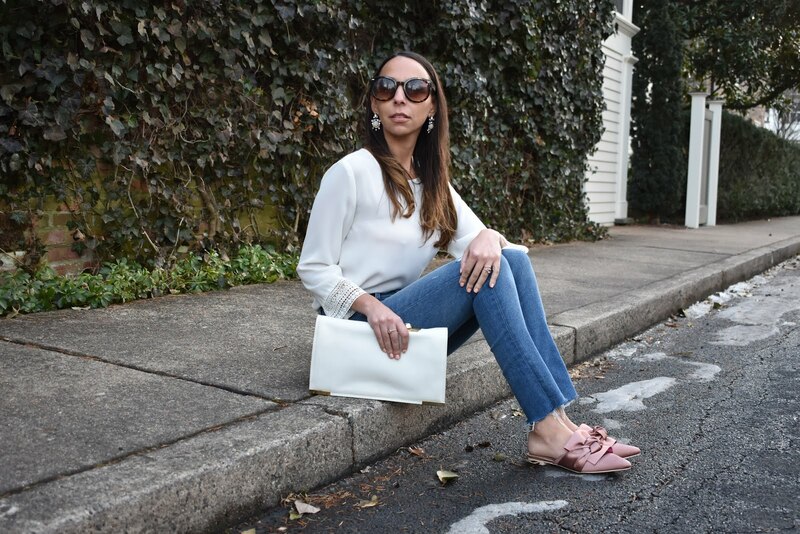 This look is simple look, a little dressy but still casual. The best part about this look is it is comfortable! I've linked my outfit details below and some similar tops since my cute top is old. Some Of My Favorite Christmas Gifts!